We’d love your help. 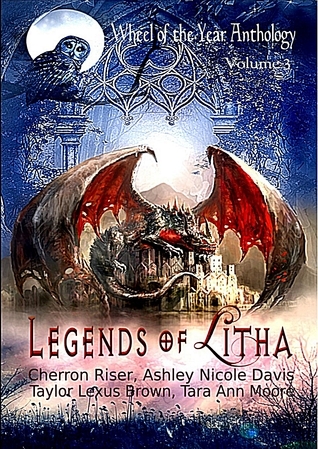 Let us know what’s wrong with this preview of Legends of Litha by Cherron Riser. Enter a magical world where those around you are not who they seem. Take a quest as fantasies become real, and mysteries unfold into beautiful tales and horrid betrayals. Inside these pages, you will be sucked into a realm where all that seemed impossible is anything but. Dragons, Bird Men, Demon Hunters, and Mermaids all Bring Forth the Power of the Creature in your Soul! To ask other readers questions about Legends of Litha, please sign up. After high schoo Cherron Riser was born in Dothan, Alabama on November 2, 1983. With her family being military, she spent a lot of her early childhood traveling all over the country, giving her a lot of new and different experiences she would not otherwise have been given. When she turned ten, however, her family settled in the small town of Ozark, Alabama where she finished her high school career. All through her life Cherron has been drawn to the arts. As a child she danced and sang all of the time, often driving her family crazy. During middle school, a group of friends and Cherron started "The Outcast" a club established for building a love of writing. Once the club was formed, Cherron was never seen without a spiral notebook and pen. She wrote daily, developing silly stories for her friends. After high school, Cherron began to write more serious stories and develop more original plot lines. It is a talent and love Cherron has developed over the years, filling her computer with story after story. As an author, Cherron began her career as a self published author, releasing the book Defying Destiny in March of 2015. She gives a lot of credit to her husband, children, and friends for inspiring her characters and worlds and looks forward to showing them to all of her readers in the near future. Cherron can often be seen at conventions, both for readers and for geeks, as she is and will always be a geek herself, and proud of it.